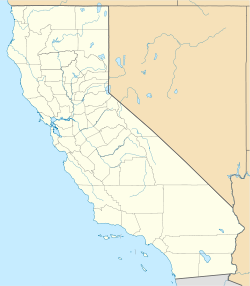 Bridgeville (formerly Robinsons Ferry and Bridgeport) is an unincorporated community in Humboldt County, California. It is located 12 miles (19 km) north-northeast of Weott, at an elevation of 636 feet (194 m). Bridgeville is 420 km (260 mi) north of San Francisco, with a population of about 25. Originally called Robinsons Ferry, it was renamed Bridgeport when a bridge was built across the Van Duzen River in 1875. The post office rejected Bridgeport as a name because of another Bridgeport (in Mono County), and the Bridgeville post office opened in 1877. Robinsons Ferry was named in honor of William Slaughter Robinson, local rancher. The 83-acre (340,000 m2) town became famous in 2002 for being the first in history to be put up for auction on eBay. It was originally sold for $1.77m but the buyer backed out of the deal only for it to be bought by businessman Bruce Krall for $700,000. Krall put the town up for sale again in 2006 for a starting price of $1.75m. According to the BBC News website, the price included three cows, eight houses, and a post office. Los Angeles-based entertainment manager and college student Daniel Thomas La Paille, 25, purchased the town on August 3, 2006 from Krall. La Paille paid $1.25 million, the money coming from his own entertainment management work as well as from his mother and grandmother. According to the Los Angeles County Coroner's Office, Daniel La Paille committed suicide November 9, 2006. The cause of death was a single gunshot wound to the chest. On June 29, 2007, Bridgeville was on the market with a $1.3 million price tag for at least several months. This was the third time that Bridgeville had been listed for sale within five years. In June 2013, Steve Farzam the COO of the prominent Shore Hotel in Santa Monica California and entrepreneur offered to purchase Bridgeville for $900,000 from Daniel La Paille's Mother. Steve Farzam had his development team visit the town where they met with the County Board of Supervisors. Steve Farzam had vast plans to redevelop this town as "America's Greenest City" since sustainability is at his forefront as it was when he developed and operates Shore Hotel which currently holds a Gold LEED certification. Steve Farzam stopped the deal since the owner wanted over $1,000,000 and the economics didn't pencil out. However, according to Humboldt County Supervisor, Estelle Fennell, Farzam wanted to start his own police force in Bridgeville, for which he would need the approval of the county sheriff. According to one of Farzam's colleagues, Farzam said he would not buy the town if he was unable to start a police department. According to Fennell, the sheriff was adamant that there would be no changes to law enforcement in Bridgeville and the deal never materialized. The Van Duzen River flows through Bridgeville. The ZIP Code is 95526. The community is inside area code 707. This region experiences warm (but not hot) and dry summers, with no average monthly temperatures above 71.6 °F. According to the Köppen Climate Classification system, Bridgeville has a warm-summer Mediterranean climate, abbreviated "Csb" on climate maps. Bridgeville is the seat of the Bridgeville Elementary School District, and home of the Bridgeville School, a public K-8 school. In the state legislature, Bridgeville is in the 2nd Senate District, represented by Democrat Mike McGuire, and the 2nd Assembly District, represented by Democrat Jim Wood. Federally, Bridgeville is in California's 2nd congressional district, represented by Democrat Jared Huffman. ^ a b c d e Durham, David L. (1998). California's Geographic Names: A Gazetteer of Historic and Modern Names of the State. Clovis, Calif.: Word Dancer Press. p. 26. ISBN 1-884995-14-4. Historic American Buildings Survey (HABS) No. CA-1456, "Bridgeville, General View, Bridgeville, Humboldt County, CA"
Wikimedia Commons has media related to Bridgeville, California. This page was last edited on 14 August 2018, at 16:20 (UTC).